It's quite the line up. As I headed back to the office from my Wednesday job, I passed the on ramp near the UPS western suburban warehouse. 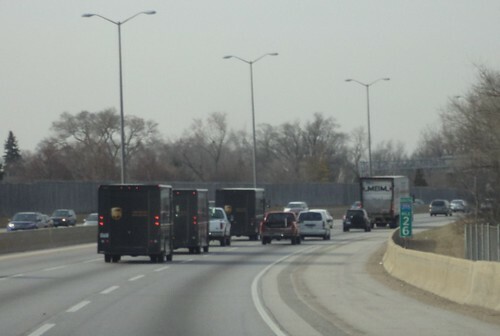 A line of brown delivery vans entered the expressway heading south. We have a great driver who delivers to the office. We used to have a good driver, but he injured his back and was replaced by several people who failed us. I got to know the UPS dispatcher by name. "Hi Lisa. It's Deb again." While it's an asset to be known by sight and name, this is not what you want. If I had to call, it was because we had a problem with a pick up or delivery. Our current driver knows everyone here, knows our hours, and is very personable. I see him around the area and we wave at each other. In the grand scheme of work, this is one job that doesn't require a college degree. You need to know your route and be willing to work. Robin said UPS is incredibly busy. He works a lot of overtime. Yes, it was awful this winter with next day deliveries not being made due to heavy snow, but he loves his job. We have put the college degree up on a pedestal and we shouldn't. Working for UPS can be just as lucrative. I make it a point to thank Robin for his work. He's also a weather barometer. When he shows up in shorts, even if we don't go outside, we know it's warm. Then we tease him about his legs. "They hired you because you have great looking legs, right?" We couldn't, as a country, do what we do without shipping companies. Think about that. The reason we have UPS and Fed/EX is because there is a need for this kind of service that is not met by the post office. I can't imagine our mailman taking our boxes or coming back for them like UPS does, after we're gone for the day. That's the service we need which UPS provides. You don't need a college education to do this.